A monthly Welsh language religious periodical serving the Calvinistic Methodists. The periodical's main contents were religious articles, poetry and serialised stories. The periodical's editor was the poet and minister, William Thomas (Islwyn, 1832-1878), with the poet Thomas Essile Davies (Dewi Wyn o Essyllt, 1820-1891) serving as deputy editor between August and December 1861. 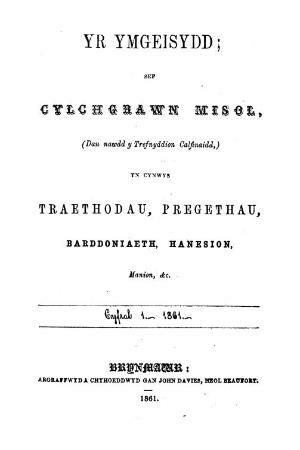 Associated titles: Y Cylchgrawn (1862).